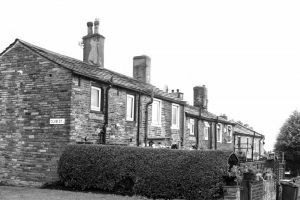 The quiet and rural locality of Lidget Green was at midnight on Monday the scene of a dreadful murder, which was quickly followed by the deliberate suicide of the murderer. The murderer was , 68 years of age, and his victim was Hannah Holroyd, aged 42. They were persons in a humble condition. Charlton was an assistant to bailiffs, and a person of very indifferent character. He was a widower, and had five or six children, all of them being able to maintain themselves. Hannah Holroyd was a widow, and had five children, the youngest of which was under five years of age. 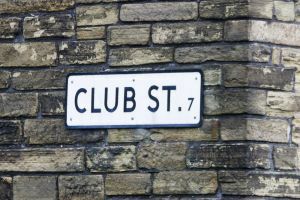 They both resided in the same street – Club street – at Lidget Green; the cottage of one being nearly opposite that of the other. 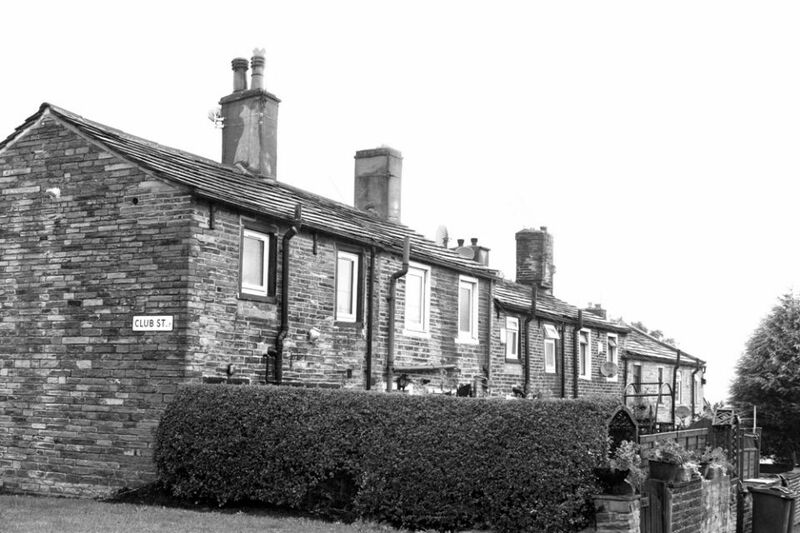 Since Whitsuntide last, an intimacy partaking of the character of courtship has sustained between Charlton and Mrs. Holroyd, the former going regularly to the house of the latter, and being frequently seen with her abroad in the neighbourhood, as well as in Bradford. Some differences had, however, latterly arisen between them, on account of Mrs Holroyd favouring the advances of a rival suitor who appeared a much younger man, Luke Normington, aged 30, just returned from serving in the militia. The circumstances exceedingly troubled Charlton, and he had often been heard to declare, with great bitterness, that if she persisted in showing this preference for his rival, he would take away her life, and then destroy his own. It was this feeling of jealousy that at length drove the wretched man to commit the horrible crimes that he had thus contemplated. 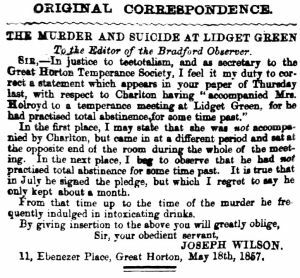 On Monday evening he accompanied Mrs. Holroyd to a temperance meeting at Lidget Green, for he had practised total abstinence for some time past. As they returned, his rival, Luke Normington, encountered Mrs. Holroyd, and spoke to her, but she passed forward, shortly calling at the house for a neighbour, not far from her own dwelling. Charlton proceeded to her house, and there awaited her arrival, silent and sullenly. She returned soon after eleven o’clock, but she again spoke with Normington on her way to her own house. Both Charlton and Mrs. Holroyd were left sitting before the fire when the eldest daughter retired to rest in the chamber, about half-past eleven. Nothing had then been said by either of them, and quietness continued. What occurred afterwards, before the tragic deed was perpetrated, there is none to tell. Soon after half-past twelve, the eldest daughter of Mrs. Holroyd was awakened by hearing the house door close. She then heard the door open, and the departing footsteps of Charlton. The light was burning in the house, and the circumstances led the daughter to suppose that her mother, who slept on the ground floor, had fallen asleep and left the candle burning. She immediately went down stairs for the purpose of locking the door and putting out the light. She bolted the door, and on turning round hence to her horror, she discovered the body of her mother lying weltering in blood, on the opposite side of the room. She was undressed as if she was prepared to retire to rest, and had her boots on. The piercing shrieks of the distressed young woman quickly brought several persons to her assistance. Policeman Binns was in the immediate neighbourhood, and on going to the door found it locked outside, the key remaining in the door. On entering, he found Mrs. Holroyd quite dead. Her head had been nearly severed from her body, and her right hand was slightly cut. Ascertaining that Charlton had been recently in the house, he crossed the road to inquire for him at his house. He then learnt from his daughter that he had entered about ten minutes or a quarter of an hour before, that he shook hands with his children, and, saying, “Farewell, you will never see me again,” then hurriedly departed. On leaving, she heard him return for a moment and lift up the cellar grate, and then go on his way. On going into the cellar, Binns found a razor which was covered with blood. Several officers, Sergeant Knowles, P. C. Binns, and Constable Jowett, immediately proceeded to search the neighbourhood for the murderer; and by this time a large number of persons were attracted to the place by the report of the horrible tragedy. They soon came to the conclusion that Charlton would destroy himself by drowning, and this belief gained strength as time wore on. The officers and their assistants consequently not only searched the fields in the immediate neighbourhood, but the mill dams and the streams. At four o’clock on Tuesday morning, the body of Charlton was found drowned in New Miller’s Dam. His hat was floating on the upper part of the dam. The body was shortly afterwards discovered at some distance from the embankment below. It was floating in a perpendicular position, just beneath the water. It was untimely recovered and removed to the new Miller’s Dam public-house. We need hardly say that this tragedy has created the greatest sensation in the district, and especially in the immediate locality of the scene. The inquest on Hannah Holroyd was held yesterday afternoon, at the Second West Inn, Lidget Green, before Mr. George Dyson, coroner, and the following jury: – Mr. Edwin Bentley, foreman; Mr. Francis Ackroyd, Mr. Alexander Wild, Mr. Joshua Horsfall, Mr. John Hudson, Mr. Jonas Jennings, Mr. Aaron Topham, Mr. Benjamin Crabtree, Mr. Wm Wardle, Mr. Charles Fox, Mr. Henry Suddards, Mr. Walton, and Mr. Jeremiah Rudd. 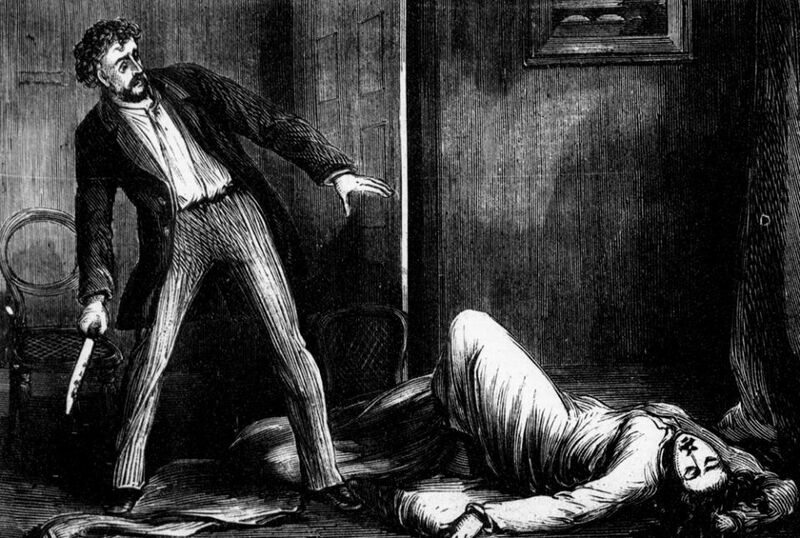 Martha Holroyd, ‘the daughter of the deceased was the first witness called. She said- I am 19 years of age. I work at Mr. John Turner’s mill. I am daughter of Hannah Holroyd, the deceased. My father, Joshua Holroyd, die about five years ago. He was a quarryman. There are five children-the youngest is about four years of age. I knew Samuel Charlton. He had no trade; he was a sort of bailiff. I don’t know if he intended to marry my mother; but he has been in the habit of coming in and sitting in our house. He has not been well received for some time past; she did not take him in properly. He had never threatened to do her injury in my hearing. I saw him on Monday evening about seven o’clock. My mother went to a teetotal meeting at Lidget Green. She came home from the meeting about half past eleven, having called at a neighbour’s house. Charlton came straight from the meeting. He was in the house an hour before she came in. He never spoke during the time he was there. When she came in, I went upstairs to bed. I left my mother sitting on a chair in front of the fire, and he was sitting at the side of the fire. My mother was cheerful when I went to bed, but Charlton neither laughed nor spoke. It would be about twenty minutes to twelve when I went to sleep. There had been no quarrel then. I never heard them speak at all. When I awoke, about a quarter to one, I saw a light which shone up stairs, I having left the door open. 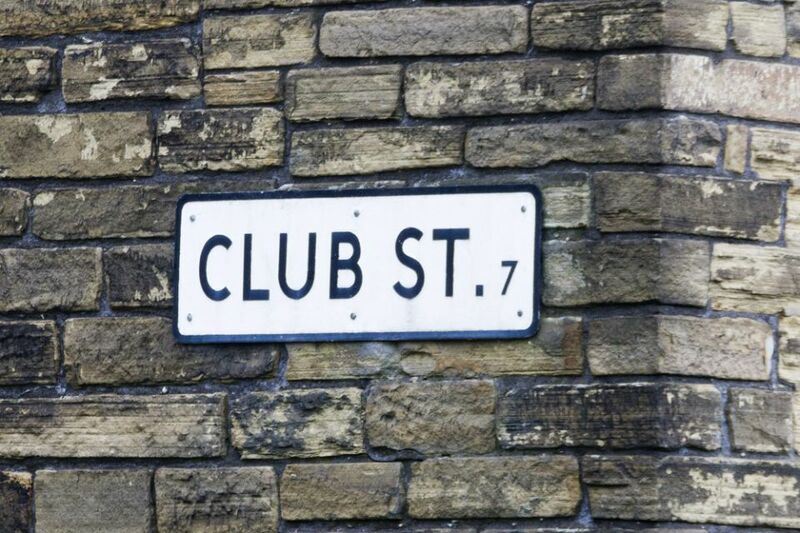 I heard the house door open, and I heard by his (Charlton’s) step that he came to the door and went back again. He went immediately. I heard the door shut, but I did not hear him lock it. I thought my mother might have fallen asleep, and I went down to fasten the door, which I feared she might have forgotten to lock. I heard neither scream nor scuffle. I barred the door, and then found my mother lying in blood upon the floor, with her feet towards the fire place. I then found the door locked outside. I gave an alarm. Abraham Pearson, Henry Jowett, constable, and Binns, policeman, came in. I know Luke Normington. My mother rather leaned to Luke. He met her as she was coming from a neighbouring house, on Monday night, and “clicked” hold of her. I went for her and saw him stop her. Charlton was at that time at her house. My mother was nearly undressed at the time she was found. I don’t know that Charlton ever stopped all night. Luke Normington had been two or three times at our house, but he did not come at the time I gave an alarm. Policeman Binns was next called. He swore: – At a quarter before one on Tuesday morning, i was on duty at Lidget Green. I was standing twenty yards from the place, when I heard a cry of “Murder.” I went to the place and found the door locked. On being admitted, I found the deceased lying on the floor with her throat cut. She was nearly undressed; she had only her chemise, her night gown, and boots on. I asked who had been in last, and was told Samuel Charlton. I then went to his house opposite in the street, and I inquired of his daughter whether her father was in. She stated that he had been there about a quarter of an hour before, had bid them all good bye, and then gone away. She also said that he had lifted up the grate and thrown something down. On going down into the cellar, I found the razor which is now produced, and which I gave to Constable Jowett. It was covered with blood, and is now stained with blood. Sergeant Knowles and I sought Charlton in the neighbourhood, and about four o’clock found the body in New Miller’s dam. I have known Charlton for several years. He did not bear the best of characters. I have seen Luke Normington go in and out of the house several times, and when I heard the scream on Tuesday night, I saw Luke Normington run away and he said, that he was afraid if he were seen he would be blamed. Luke came from this inn, about twenty minutes to one o’clock, and the screech occurred about five minutes after. I followed him from this house to the other. The screech occurred, and he ran away. Ellen Dyson, daughter of Samuel Charlton, lived with us. He left the house about eight o’clock at night. He was going to the teetotal meeting. I know he kept company with the deceased. He returned home about one o’clock by our clock, which is twenty minutes too soon. He came to the bedside and bade us all farewell; he said we should never see him again. He appeared in great trouble. He then bade us good night, and went out. I heard him immediately come up the door stones, and lift up the grate. I know nothing of any razor: I saw one which Binns afterwards got from the cellar. We had never had anything wrong; we thought nothing of what he had said. My father had never said he would do her harm. He had kept company with her since Whitsuntide. David Naylor, landlord of the Second West Inn, was called. He said: I know Luke Normington. He was in my house nearly all the evening, from something like six o’clock till one, but going out occasionally. He was in this house from twelve till ten minutes to one. He went about half-past ten, and came in about half-past eleven o’clock. He then stopped till ten minutes to one. He was rather “fresh” when he went out. An inquest was afterwards held on Samuel Charlton, by Mr. Dyson and the following jury, at the New Miller Dam Inn:- Mr. John Fearnsides, foreman; Messrs. James Reaney, S. Settle, J. Denby, R.Collins, T. Bastow, Reuben Askwith, J. Willman, J. Clark, T. Pitt, E. Anderton, and James Halliwell. The Coroner read the evidence which had been taken at the former inquest, telling the jury that a verdict of “Wilful Murder” had been returned against Samuel Charlton, and that it was for them to determine whether the deceased Samuel Charlton had fallen by accident into the dam or whether he had died from felo de se. John Knowles, sergeant in the Bradford police force, was first called. He deposed: I was on duty at Lidget Green on Monday night. I went to visit Reuben Binns on his beat at Lidget Green, at one o’clock. When I was in Legrams Lane, I heard his signal-a double whistle-and I went back to him. I was between two and three hundred yards from his him. He said there had been a murder on the Green. I went to the house of Hannah Holroyd. The woman was lying weltering in blood, on the floor, with her throat cut, quite dead. I made enquiries as to who had been in the house, and the daughter said she had left Charlton sat by the fire. I made a search for the weapon, but could find none. I then went to Ellen Dyson’s to look for him, but did not find him. The daughter said that Charlton had been in some twenty minutes before, and had gone away. I then went to Great Horton and called the surgeon, Mr. Thomas. I got a lamp and made a search through the fields on Scholemoor and Birks. I was then joined by Superintendent Burniston of the Bradford police force. I then went back to Lidget Green and heard that the razor was found. I came down Thief score Lane and searched all the becks to the New Miller Dam. Coming on the south side I found a hat floating near the top. I then went 100 to 150 yards along the dam side, and I saw something floating in the water which I found to be the skirts of his coat. On examination, I found the body of the deceased. He was four or five yards from the side. He was floating-his feet did not touch the bottom. I then called up the people at the boat house, and he was conveyed to the New Miller Dam Inn. He appeared quite fresh, as if he had not been long in the water. His clothes were correct, and there was no mark of injury upon him. I have known him for a long time. I had him once in custody for felony, and recently he has been committed for a month under the Worsted Act. His general character was not good. He dealt in cotton and worsted waste. I have seen him repeatedly with Hannah Holroyd since last Whitsuntide. I have known him to be in her house all night for several nights in the week. He was of perfectly sound mind. I saw him last Saturday night. Mr. Jonas Denby (one of the jury) said that he let the house to Charlton, for Mrs. Holroyd, about seven months ago, and he had frequently seen them together as man and wife. She always paid the rent. Henry Jowett, a constable at Great Horton, said: I received information of this occurrence about a quarter past one. Sergeant Knowles called me up. On going to the woman’s house we found her laid in her own blood, and the floor covered with blood. Her throat was cut, as well as one of her fingers on the right hand, and she was quite dead. I was told of Charlton having been with her. His daughter said that he had gone out about an hour since, and bid them all goodbye. She said he had opened the grating and dropped something in. I was with P.C. Binns when he found the razor produced in the cellar. There is blood upon it. It was put under the cellar plate. I went in search towards the old dam at Lidget Green, over the fields, in the direction of Great Horton. I have known Charlton for 30 years. He was a man of bad character, and I believe he was a man of sound mind. The Coroner then briefly directed the attention of the jury to the nature of the evidence, and asked them to consider whether from that evidence the deceased was of sound mind or not, because, if they were of opinion that he was in a sound mind, their verdict would be felo de se. The Jury then deliberated for a brief period, and returned a verdict of felo de se. The Coroner said that he would have to give to the constable a warrant ordering the body to be interred between the hours of nine and twelve the same night. During twenty years, this was the first instance of felo de se which had occurred in more than 3000 inquests, in his district. 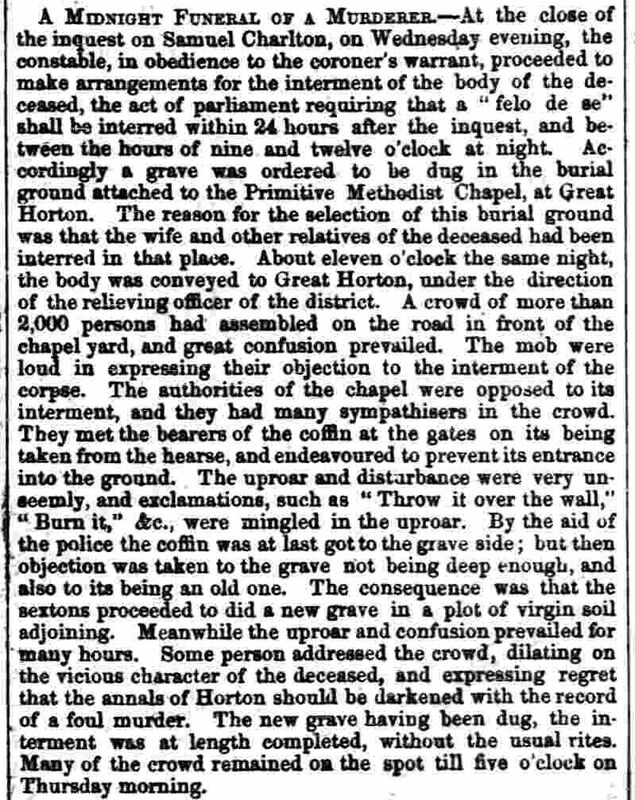 At the close of the inquest on Samuel Charlton, on Wednesday evening, the constable, in obedience to the coroner’s warrant, proceeded to make arrangements for the interment of the body of the deceased, the act of parliament requiring that a “felo de se” shall be interred within 24 hours after the inquest, and between the hours of nine and twelve o’clock at night. 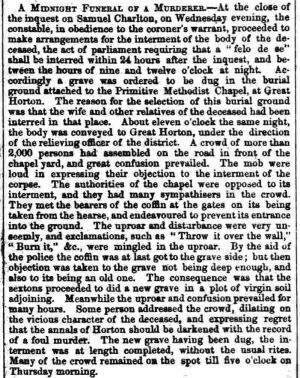 Accordingly a grave was ordered to be dug in the burial ground attached to the Primitive Methodist Chapel, at Great Horton. The reason for the selection of this burial ground was that the wife and other relatives of the deceased had been interred in that place. About eleven o’clock the same night, the body conveyed to Great Horton, under the direction of the relieving officer of the district. A crowd of more than 2,000 persons had assembled on the road in front of the chapel yard, and great confusion prevailed. The mob were loud in expressing their objection to the interment of the corpse. The authorities of the chapel were opposed to its interment, and they had many sympathisers in the crowd. They met the bearers of the coffin at the gates on its being taken from the hearse, and endeavoured to prevent its entrance into the ground. The uproar and disturbance were very unseemly, and exclamations, such as “Throw it over the wall,” “Burn it,” &c., were mingled in the uproar. By the aid of the police the coffin was at last got to the grave side; but then objection was taken to the grave not being deep enough, and also to its being an old one. The consequence was that the sextons proceeded to dig a new grave in a plot of virgin soil adjoining. Meanwhile the uproar and confusion prevailed for many hours. 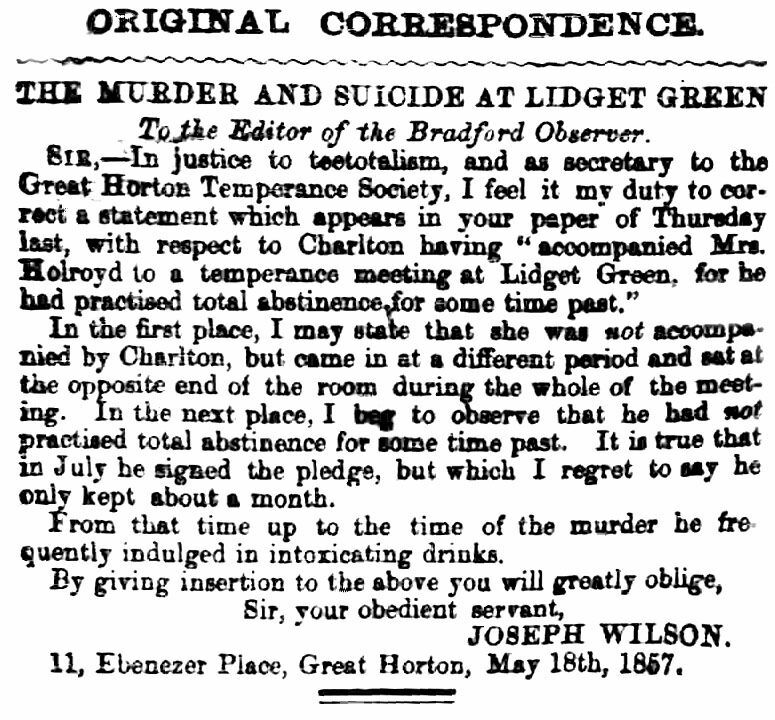 Some person addressed the crowd, dilating on the vicious character of the deceased, and expressing regret that the annuals of Horton should be darkened with the record of a foul murder. The new grave having been dug, the interment was at length completed, without the usual rites. Many of the crowd remained on the spot till five o’clock on Thursday morning. In the first place, I may state that she was not accompanied by Charlton, but came in at a different period and sat at the opposite end of the room during the whole of the meeting. In the next place, I beg to observe that he had not practised total abstinence for some time past. It is true that in July he signed the pledge, but which I regret to say he only kept about a month. From that time up to the time of the murder he frequently indulged in intoxicating drinks.